Probably no other Indian in the West knew more white people, individually, than he knew; also, he was known at sight to more white people than was any other chief of his time. His name was so famil­iar among the whites, that its mere mention was a safe passport to any home of the settlers. Shabona was well aware of that fact and he always introduced himself as "Mr. Shabona." Baldwin says that Shabona was born in Canada; but Matson asserts that he was born on the Kankakee in Will County, Illinois; and the "Handbook of American Indians" gives Mau­mee River, Illinois, as his birthplace. This con­tention of many countries as the place of Sha­bona's birth, proves the greatness of the man. Argos, Rhodes, Smyrna, Chios, Colophon, and several other cities, claim to be the birthplace of Homer; and Scotland, England, Wales, and Britany, of St. Patrick. Authors agree that Shabona was born in 1775 and dwelt at Sha­bona's Grove for fifty years. He was a grand­nephew of Pontiac and his father who was an Ottawa chief, fought under Pontiac. Shabona was six feet tall, erect, and weighed over two hundred pounds. 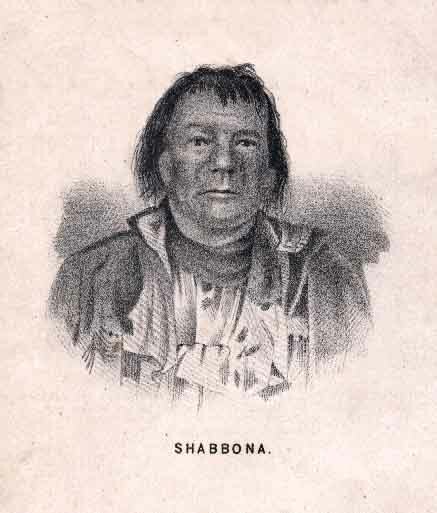 During the wars of 1812, 1827 and 1832, Shabona rendered great services to the white people by saving the lives of many of them who were taken captives by the Indians, and by pro­tecting the home of John Kinzie and his friends during the Chicago massacre. However, with his tribe he joined in the border war against the whites and fought beside Tecumseh when he fell at the battle of the Thames. That was the last time that Shabona raised a hand against the white people. When Col. Richard M. Johnson, who com­manded the American army at the Thames be­came vice-president of the United States, Sha­bona made a visit to him at Washington. The vice-president gave Shabona a heavy gold ring, which he wore until his death and at his request it was buried with him. On account of Shabona's great services to the white people, the state of Illinois gave him two and one-half sections of land at the site of his Paw-Paw Village. 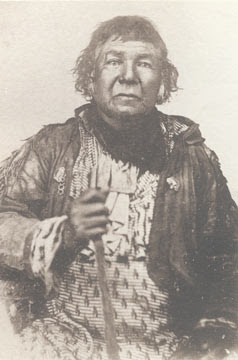 In 1837 the last of Sha­bona's tribe having been moved to a Kansas reservation, he followed them with his family consisting of twenty-seven persons, including his son Pypagee and nephew Pyps who were soon thereafter slain by the Sacs for the parts that they played in notifying the whites to flee to Ottawa, before the massacre at Indian Creek. Shabona was warned that the Sacs were schem­ing to assassinate him, because of his efforts to save the whites, and in 1855 he returned to Illinois. Before Shabona left Illinois for Kansas, he placed his lands in the hands of an agent named Norton to collect the rents, pay the taxes and to look after them generally. Unconscionable settlers squatted on Shabona's lands and filed in the government land office, affidavits that Shabona had abandoned the lands, and on that proof and some technicalities the lands were again sold as public lands, and on Shabona's return he found his domain in the possession of the squatters who claimed to be the owners. Shabona could not help feeling that he had been cheated by the whites, after all he had done for them, and the old man sat on a log near where his village had formerly stood and wept bitterly. Shortly after his return, as Shabona was cut­ting a few poles to erect a tent on the margin of the grove that bore his name, a settler at­tacked him and forcibly drove him off the land, and shamefully abused the old man. Then for some time homeless, he wandered about from place to place, the few remaining whites whom he had befriended, always giving him a warm welcome. The old warrior's plight aroused the dormant gratitude of a few whites who raised a fund with which they bought for him at Sen­eca, on Mazon Creek, near the Illinois River, twenty acres of land which they cultivated and erected a dwelling-house thereon. Because of his natural desire to live out-doors, Shabona lived in a tent nearby and used the cottage for storage purposes. Through the efforts of his friends, the government granted him a pension of two hundred dollars a year, on which he subsisted until he died in 1859, at the age of eighty-four years, and was buried in Evergreen Ceme­tery, at Morris, Illinois." originally published in Indian Massacre & Captivity of Hall Girls in Black Hawk War, 1915 by Charles M. Scanlan.